Tennis accounted for nearly three-quarters of all suspicious betting identified by a leading sports gambling watchdog in 2015. Essa says it identified 100 cases with 73 of them occurring in tennis matches. Last month a BBC and BuzzFeed News investigation found evidence of widespread suspected match-fixing among leading players over the past decade. Essa issues alerts to regulated bookmakers across Europe when irregular activity is spotted on a match. If several bookmakers confirm that they are encountering suspicious betting patterns, the watchdog sends a formal warning to the sport's governing bodies. Of the 73 cases, 24 of them occurred in the final three months of 2015. According to Essa, football - the world's biggest sports gambling market - attracted suspicious betting on 19 matches worldwide. The BBC and BuzzFeed investigation found 16 players who have ranked in the top 50 in the past decade have been repeatedly flagged to the Tennis Integrity Unit (TIU) over suspicions they have thrown matches. Following the report, the Tennis Integrity Board, which oversees the TIU, said it would start an independent review into its anti-corruption practices. This will take at least 12 months. 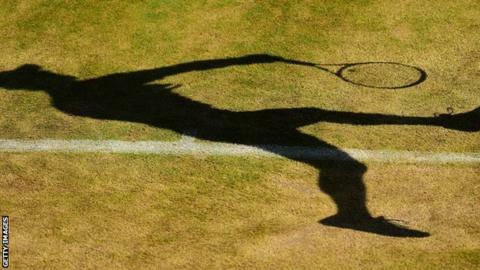 The TIU said in a statement that suspicious betting activity in tennis is not necessarily proof of corruption. "Statistics of the kind released by Essa must be considered in that light." Unranked Thai player Jatuporn Nalamphun has received an 18-month ban and a $5,000 (£3,490) fine after being found guilty of betting offences under the Tennis Anti-Corruption Programme.